What proof is there that subtle bodies exist? Why is subtle body important? The “whole body” referred to by Reginald Ray includes both the coarse body and the subtle body. In Tantric Buddhism, the understanding of the subtle body is essential: chakras and channels. Note: Seek the advice and permission of a teacher to engage in actual Tantric practices. This feature is only a general information story. Practice requires full instruction. Healing practices in Vajrayana inevitably involve subtle body. Centuries of successful healing Tibetan and Chinese medicine and various Tantric healing methods certainly present convincing anecdotal support for its effectiveness. Understanding the subtle body is also critical to practicing certain generation and completion stage yogic practices, including “deity yoga” and “tummo, and certainly the higher tantric practices and completion practices. Even the most basic of understandings of “subtle body” is helpful to all Tantric Buddhist meditations. 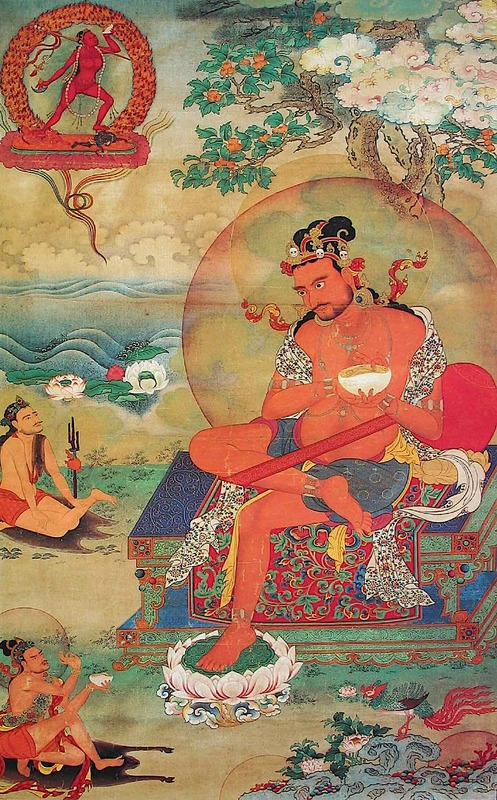 The great sage Naropa meditating before his Yidam Vajrayogini. Naropa’s famous teachings are the Six Dharmas of Naropa. bardo (Tibetan: བར་དོ, Wylie: bar do, S: antarābhava) – the yoga of the intermediate state. Shaking the Head and Entire Body – pulling the fingers, followed by massaging the two hands. Tummo practice is often pointed to as “proof” of subtle body. Experienced practitioners can meditate naked in sub-zero weather without discomfort. None, is the short answer, at least concerning pure science. Anecdotally, there is some substantial support for the subtle body, such as studies of Chinese Medicine. Acupuncture — which focuses on subtle body meridians and acupoints, are considered by many to be proof of chakras, meridians and their connection throughout the subtle body. Acupuncture’s ability to suppress pain during significant surgery has been well-demonstrated. Other than anecdotal support, we cannot prove or disprove the subtle body — any more than we can scientifically prove life after death or rebirth. It’s just too subtle to measure with instruments. Most teachers, such as H.E. Zasep Rinpoche, also point to the long history of accomplishments of Tibetan Yogis and Yoginis. In speaking on healing and health in a Medicine Buddha retreat, he talked about both the effectiveness of Acupuncture and the long history of Gurus and teachers who have used subtle energy practices to attain realizations, and even “longevity.” It is difficult to brush aside centuries of lineage experience. 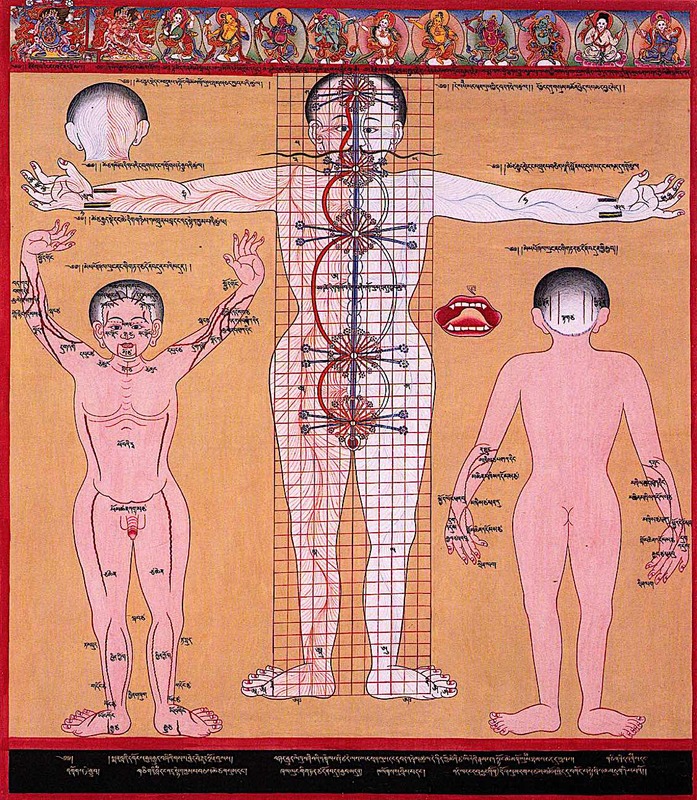 Old Tibetan medicine drawings illustrating the subtle body, including the chakras and channels. In Tibetan Tantric Buddhism, five chakras are visualized as the connecting points of the three channels: central, left and right. Due to confusion with “new age” chakras — which are typically seven, and based on Indian yoga — most Vajrayana teachers don’t touch on Chakras until students are advanced. 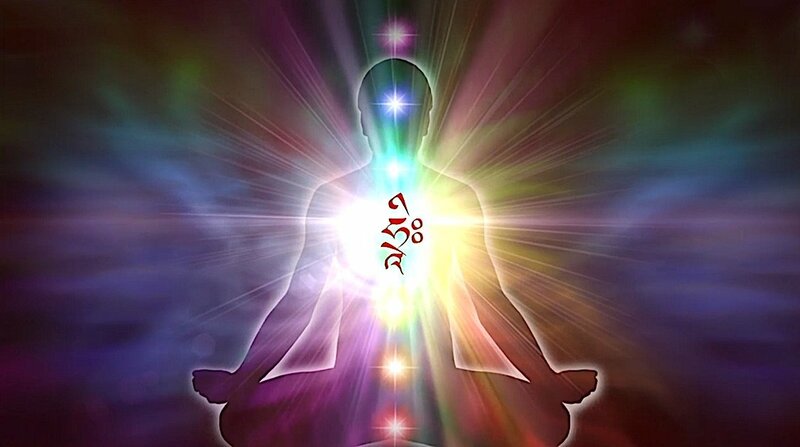 The most important are notably the three universal chakras of crown, throat and heart. When we prostrate to the Buddha, we touch each of these chakras as we bow; some people touch all five chakras when they prostrate. 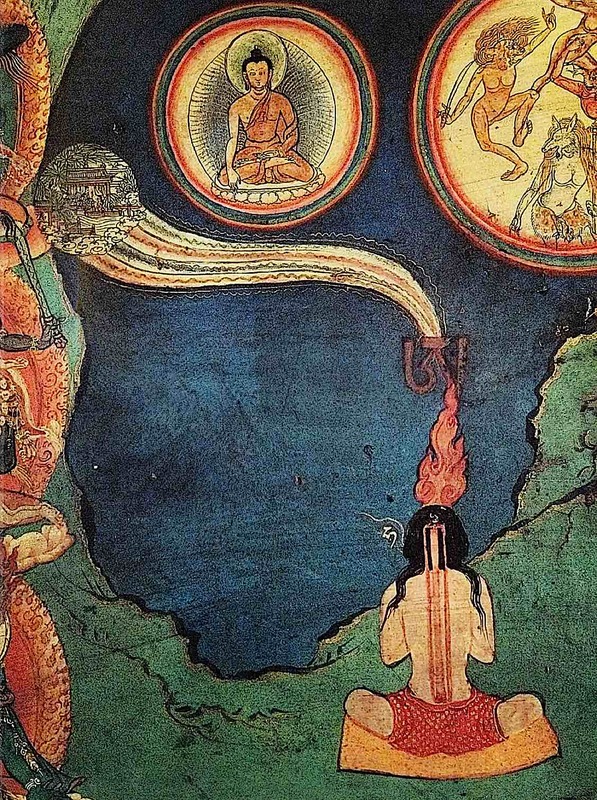 The navel chakra is also common to all chakra systems in Tibetan Tantric Buddhism: four, five, seven or ten, but may not be emphasized in devotional practices. The secret chakra tends to be limited to Higher Yogic practices, and the remaining two or five (depending on system) are highly specialized practices. They are the junction points for the three main channels (central, left and right), ultimately connecting the 72,000 nadis (channels) which carry vital La (“life force” in English, Prana in Sanskrit, Chi, in Chinese) to every cell of the body. You visualize your own body as hollow, the nature of divine light, and in the centre of your chest you visualize seed syllable of your meditational deity. In this case, the syllable is HRI, the Dharmakaya (see below) seed of Amitabha, Chenrezig, Hayagriva and Padma family deities. Visualizing seed syllable at ONE chakra — the heart — is the one practice common to most deity practices in Tantric Buddhism. Amitabha, or any member of the Padma family, symbolize Compassion. Meditating on Hri at the heart brings compassion to the heart chakra. Three channels of the subtle body, central, left and right. At a more pragmatic and fundamental level, subtle body is essential for healing, such as Medicine Buddha meditation or La Gug. For higher practices, subtle body is tied to completion practices and a key to Enlightenment or realizations. Also, the chakras and even the number of spokes or petals in each chakra are critical to visualizing the “body mandala” — a higher-tantra practice. Famously, it is the key to Tummo practice — generating the inner furnace. Some practices focus on only one chakra — for example, visualizing the seed syllable of Buddha at one’s heart — and others emphasize three, notably crown, throat and heart (for example, when prostrating). Most, but not all Tantric Buddhist Practice emphasize the five chakras of head, throat, heart, navel, and secret; or, at least the four of crown, throat, heart, navel. Heart: Mind — also “sleeping” activity. Note: in Tantra, “mind,” not to be confused with ‘brain,’ is always associated with the heart, not the head. In working with the chakras we remove the coverings of our energy system and meet our energy much more directly. When ego templates are stripped away we are left, for example, with the spontaneous outpouring of love for other people. The reason we work with chakras in Tibetan Buddhism is to actualise the Bodhisattva Vow of saving all beings. We have to realise the great compassion of the Buddha, where there is no impediment between the natural compassion of the energetic body and other people. 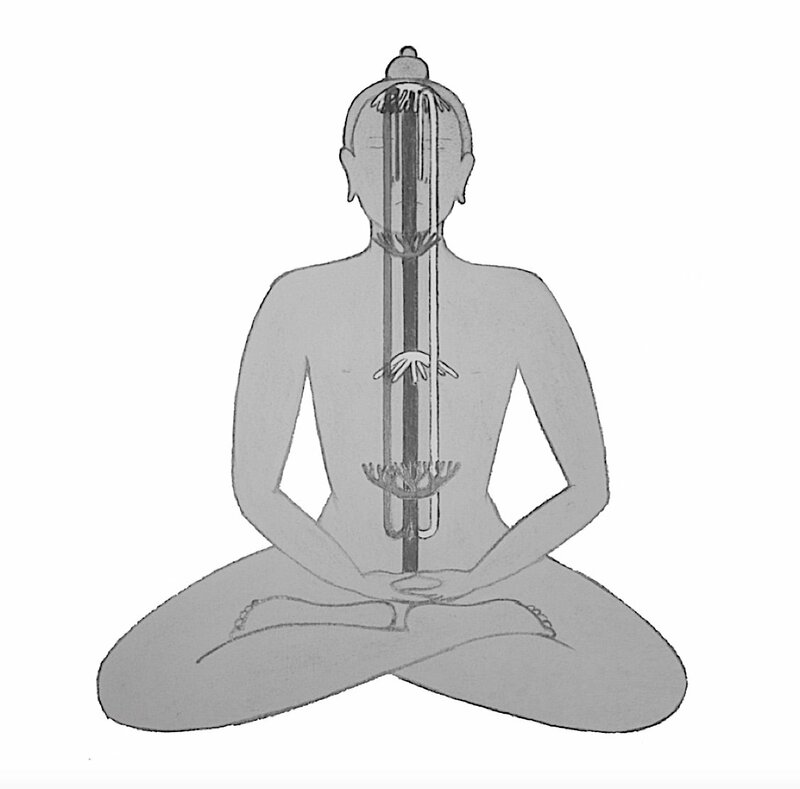 Throat: Sambhogakaya, Body of Enjoyment (sometimes “Bliss Body” — which is why it is called the “Enjoyment Chakra.” This is the manifestation of an Enlightened Being as the “object of devotion” or the Body of a Buddha as it appears in the Pure Lands. What do the bodies mean? In the doctrine of Trikaya, Buddhas can manifest in different “modes of being” depending on the understanding of the student. For example, Shakyamuni Buddha manifested as Nirmanakaya, the Body of Manifestation. Taking instruction from a qualified teacher is essential. The attributes of the chakras can vary, depending on the tantra practiced. Also, it’s easy to be confused with either Indian Tantra, or with very pervasive “new age” chakra symbolism and imagery. Forget most of the images you see online for chakras and inner bodies, as these are 99% based on Indian yogas or new age practices. 64 spokes or petals at the navel chakra. All tantric practices, even the basic ones, include visualization of at least these three chakras. The remaining two, navel and secret, are always there, but may not be visualized actively in more basic practice. They are critical, however, to higher tantra, tummo, the Six Yogas of Naropa, and Completion Practices — all of which are higher practices requiring initiation and teachers. The colours and correspondences assigned to the chakras varies by individual Tantra. When practicing a Higher Tantra, the student should focus on the correspondences of that tantra instruction. 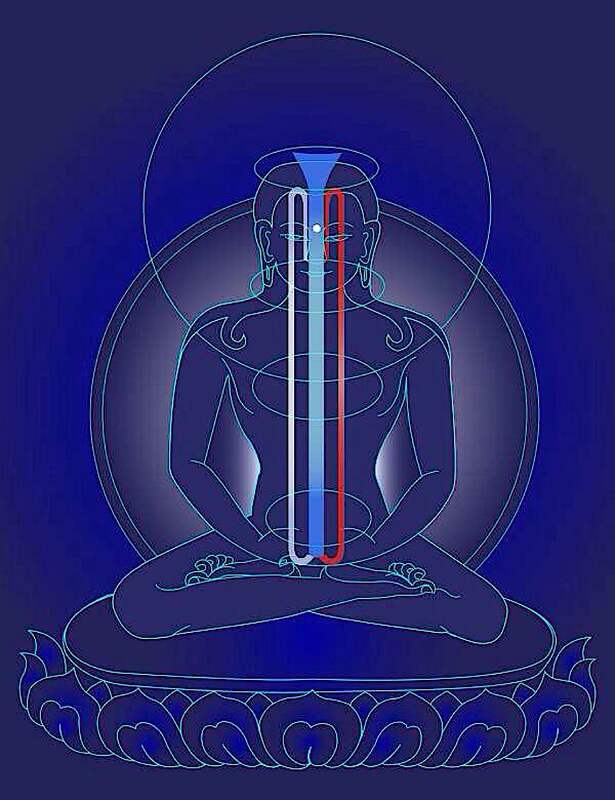 Heart (blue): Mind, Dhyani Buddha Akshobya, but also including Medicine Buddha, etc. Navel (yellow): Tummo Fire, Dhyani Buddha Ratnasmbhava and Jewel Family — i.e. associating Ratnsasmbhava with manifestation and earth. Secret (green): Wind Action, Dhyani Buddha Amoghisiddi and the Double Vajra Family including Green Tara. 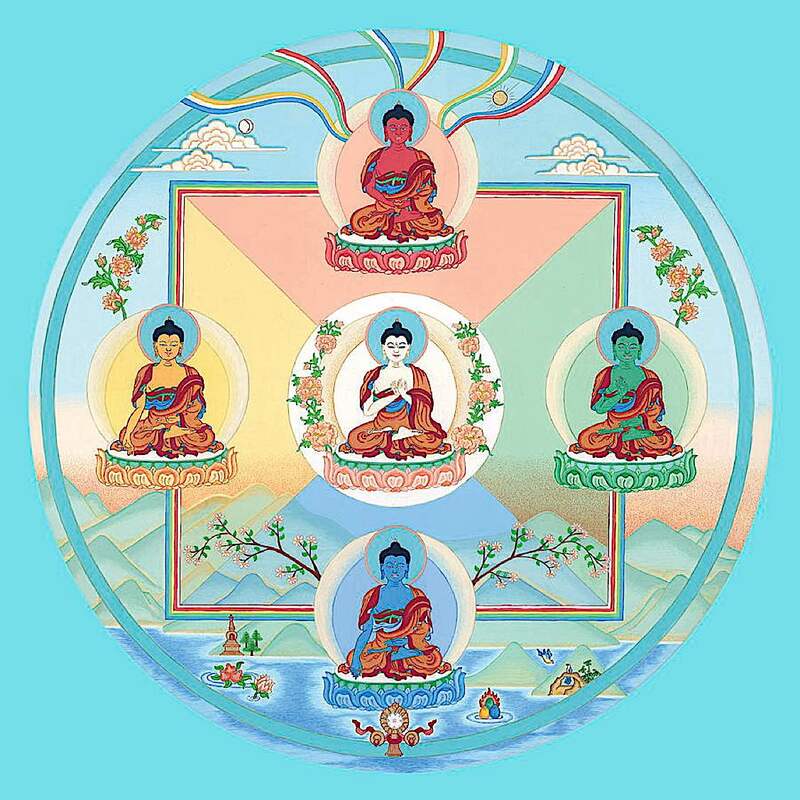 The Five Wisdom Buddhas mandala: centre Vairochana, top Amitabha, right Amoghasiddhi, bottom Akshobya, left Ratnasambhava. The positions can vary from school to school or based on specific tantras or teachings. These assignments are over-arching, but they change, just as do mandalas in meditation, depending on the Enlightened Deity practice. Usually, for instance, in a mandala, the meditational deity is always in the centre. So, for example, if Amitabha is normally in the “west” of the Mandala of the Five Dhyani Buddhas, he is visualized in the centre during his meditational practice. Likewise, a practice on Amitabha may visualize Amitabha’s seed syllable at the Heart Chakra. Mandalas and correspondences change with practices. Always be guided by your teacher and your practice. As you can see, understanding subtle body is not as simple as memorizing five chakras. 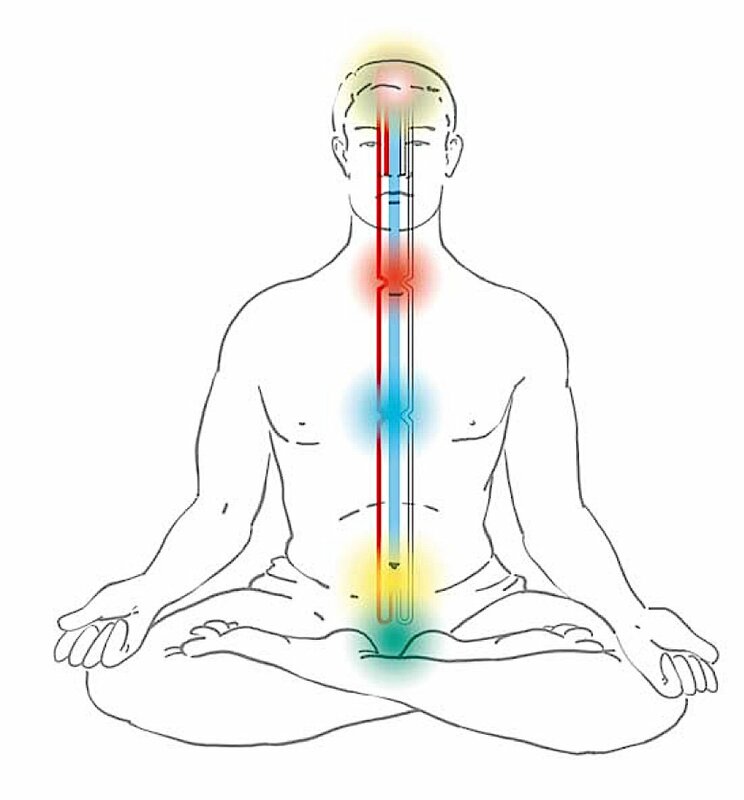 The inner body has a main central channel, two side channels (all of which meet at the five chakras) — but these are, in turn, connected to numerous meridians and 72,000 nadis throughout the body. Completion practice, especially, uses all five chakras very actively, as a method to attain Enlightenment, but requires a teacher and initiation.